*Would you like to see yourself on this list? Employment opportunities at Duck-Rabbit can be found by clicking here! 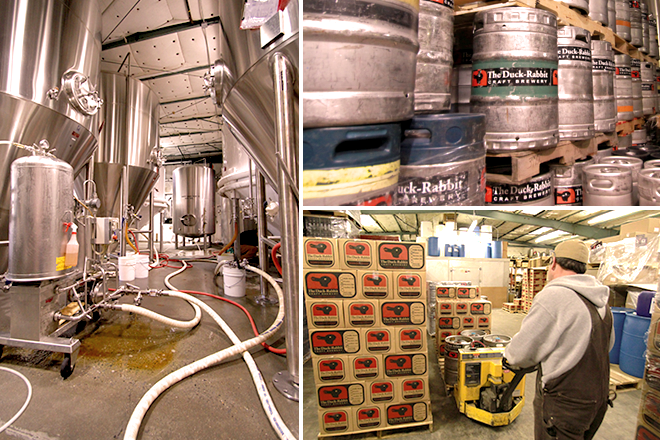 All Duck-Rabbit operations (brewing, packaging, warehousing, and shipping) are housed at our facility in Farmville, NC. We brew on a 20-barrel brewhouse (one barrel being 31 gallons) into 20, 40, 60, and 80 barrel tanks. To get to the brewery, take Hwy 264. Get off at exit #63 (this puts you on Hwy 258) and go south toward Farmville (that’s a right turn if you were going east on 264 or a left turn if you were going west on 264). Go through one stop light, then through one stop sign. At the second stop sign, turn right onto W. Pine Street. We are the last building on the left side before this street ends at a “T” intersection. Our address is 4519 W. Pine.